At Barstow’s, you can enjoy baked potatoes, our potato breakfast burrito, and a variety of potato cheddar soups, changing with the seasons. Our produce section always contains Swaz Potatoes, locally grown or sourced. Swaz Potato Farms has been a friend and farmland neighbor to the Barstow’s for generations. Our fields are in the Connecticut River Valley – characterized by some of the richest soil on earth. Founded by John Rupert Szawlowski in 1910, Szawlowski Potato Farms, Inc. is now one of the largest potato farms in New England. 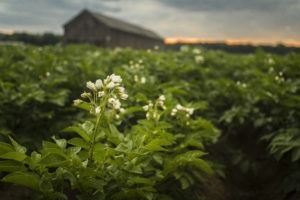 With 5,000 acres of Round White, Red, Gold and Russet potatoes under production in the Pioneer Valley, they offer local potatoes to customers throughout the northeast from July through December. In addition to offering their Massachusetts-grown crop, the Szawlowskis’ source and pack product from growing partners across the country, providing quality potatoes year-round. The Szawlowski family has worked hard for over 100 years and takes pride in providing the quality and dependability that is expected from their customers. Purchasing Swaz Potatoes from Barstow’s Dairy Store and Bakery sustains green space in the Pioneer Valley, two local family businesses, and supports agriculture for generations to come!